Once again, we’re doing our part of The Unfinished Manuscript. Previously, we did a Focaccia, and this makes a fine accompaniment to it, or works well on it’s own as a one dish dinner, or a fish course for a much larger meal. As before, the author’s recipe just didn’t wow me. Not that there was something wrong with it, it was just rather pedestrian. So we’ve amped up the flavors a bit and gone head first into fishy pasta world. 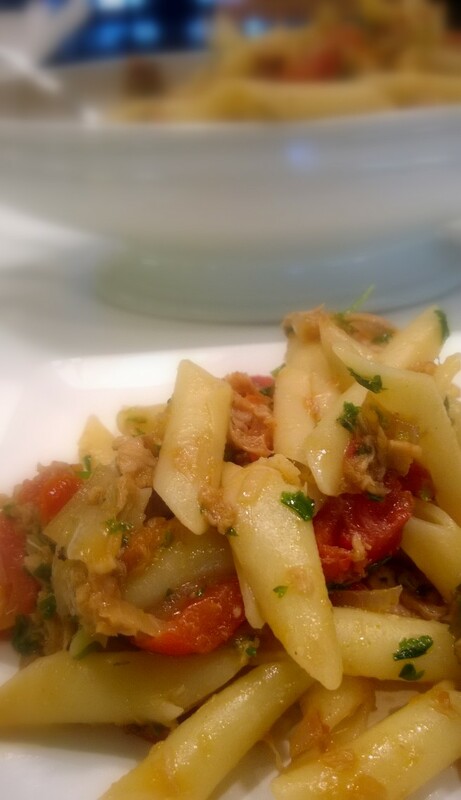 I think every culture has some sort of noodle-y, fishy comfort food dish, and this one is of Sicilian origin. Think of it as laborers food… dressed up a bit. It’s quick, easy, and thoroughly satisfying. It’s important to note – only use tuna packed in olive oil. Tinned tuna that is packed in water has absolutely no flavor, and you really, really want fishy flavor for this recipe. If you are dead set against using tuna packed in oil, then add an additional 2 tablespoons of olive oil to the list of ingredients. 1 Can Roasted Tomatoes – Diced and Drained. The recipe from the manuscript was originally written as penne. 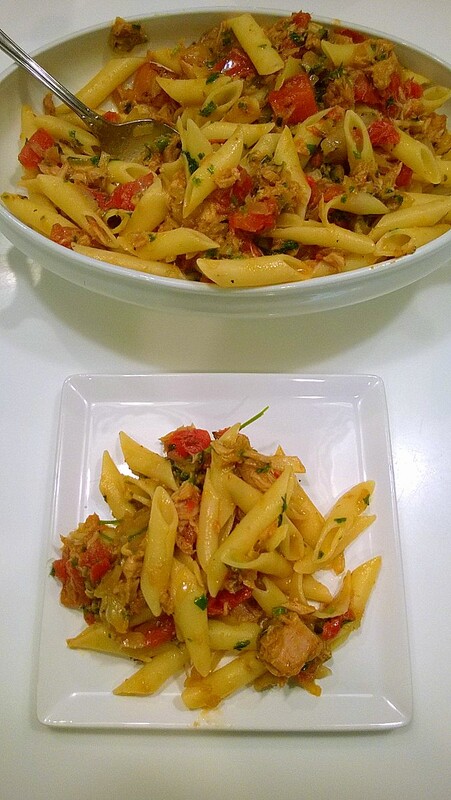 And, while penne is good – I just don’t care for the chewiness and thickness of that particular shape. Like you already know, I like my noodles more on the floppy side. Instead, I’ve used Mostaccioli- a smooth, thin-walled, type of penne that gets deliciously floppy in the sauce. 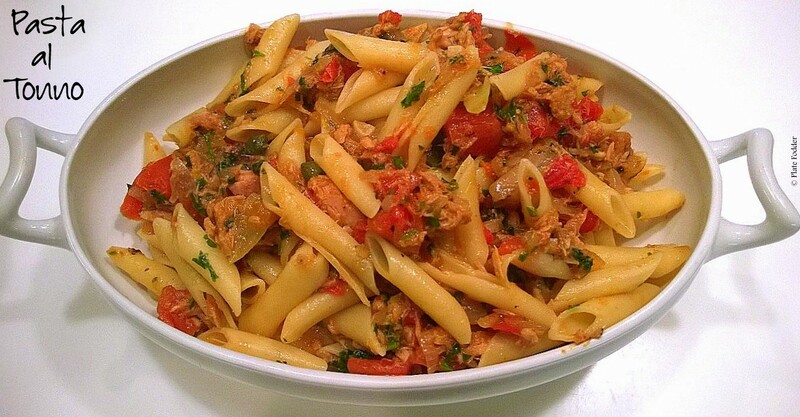 While the pasta is cooking, drain and reserve the oil from both the tuna and the anchovies. Add that oil to a skillet and bring to medium heat. Add the onions, anchovies, and garlic to the hot oil and cook until translucent. Once the anchovies have dissolved in the oil and the onions are nicely colored, add the tuna, capers, parsley and black pepper. Drain the pasta and reserve 1/2 cup of the pasta water. Add the retained water to the sauce along with the drained Mostaccioli. Remove from the heat, give it a good stir and turn into a serving dish. 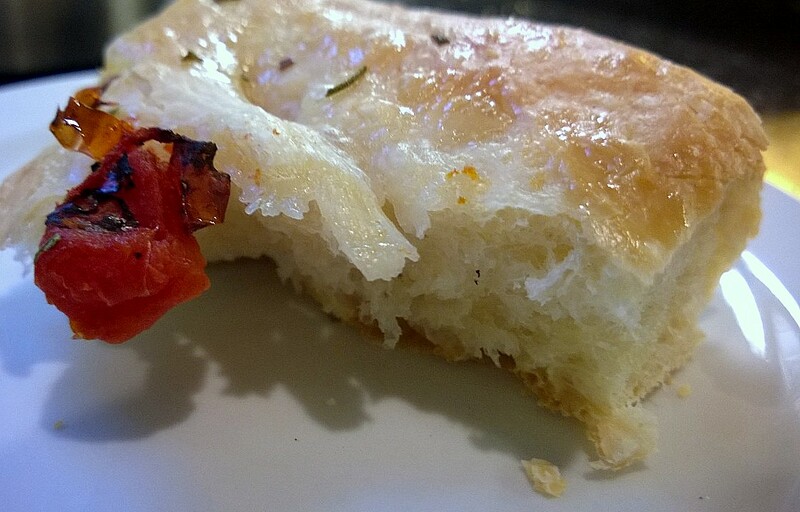 Top with red pepper flakes and serve it up with some of that focaccia you just made.